Parents are the most cautious beings on the planet. Of this breed, none are more cautious or crazy-paranoid than the Father who was lucky (or unlucky) enough to have 3 darling daughters to take care of from infant to toddler to blushing teenagers and into adolescence. I should know, I have a father who is exactly like this. You see, I'm the eldest daughter in a family of 3 girls. I've had my share of being told what I can and can't do, 12-midnight curfews, being fetched by my Dad to and from wherever I was going and zero overnight parties or out-of-town trips with friends. This went on until I just about graduated from college. Pretty tough loving huh? That's my Papa Bear for you. When I spent last weekend in Sagada, some things happened there that you shouldn't ever ever, i mean NEVER, tell my over-protective Papa Bear. Else he'll be like Don Vito Corleone on you. And believe me, my Dad can do a Marlon Brando better than anyone you know. So, do you promise not to tell him? Do you swear on your backpacks? Pinky swear? ﻿ 1 Get down from there, little lady. You'll fall and break that pretty little neck of yours! I can just imagine my Papa Bear shouting at the top of his lungs if he saw me riding a jeepney. Topload style. If you don't, I'll be the one to break it once you get back down. I don't know about you but everytime my Dad says this to me, there's no way in hell am I coming down. I'd rather stay up there and risk breaking my neck from a fall rather than face his wrath! So it's not surprising that I not only rode topload on the way to Bomod-ok Falls, I did it AGAIN on the way back. Sorry Daddy! But look, the good news is I still have my pretty little neck attached to my head. 2 Think twice before doing something you might regret in the end. When I saw Bokong Falls in all it's 20-foot splendor, I felt the strongest urge to do something (probably the same pull I felt when I saw that Boracay sandcastle). My papa will be quick to tell you that once I get something in my head, I will not rest until I get it out of my system. My papa would say I'm bull-headed. I rather prefer strong-willed, thank you very much. My Dad's heart would probably skip a dozen beats if he saw what I did in Bokong Falls. 'Gahi kag ulo', he would say. All that shrieking was NOT because of the 20-foot drop but because that water was ice cold. About 0 degrees icy! 3 That's like an accident waiting to happen. Don't do it! 300 meters below ground for more than 4 hours? Rappelling without harness? Slippery rocks that could lead to instant death? One tiny slip and a 150-meter fall into darkness and empty air? Susmaryahusep! That's what my Dad would say. Our SAGGAS tour guide, John, shared that 80% of tourists, who initially signed up for the cave connection tour, back out when they hear the words mentioned above. 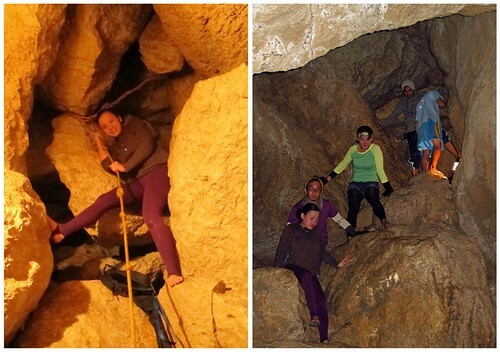 Most opt to take the easy way and just drive to the opening of Sumaging Cave instead of spelunking their way to it. For us, that was like cheating to get to the finish line faster. 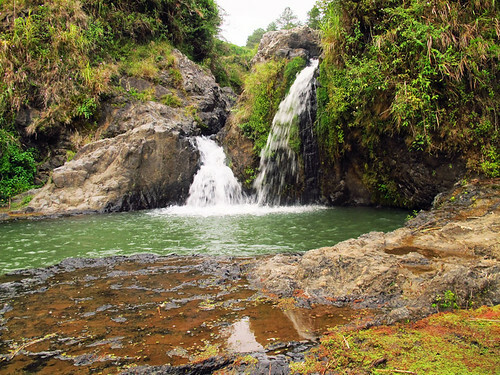 You came from far far away land and rode a 12-hour bus to get here yet you miss out on Sagada's main attraction? What's up with that? I climbed, rappelled, clung to rocks (or my tour guide, whichever was nearer), huffed and puffed my way through the cave. In the end, I crossed the finish line. No shortcuts. I conquered Sumaging Cave. It was exhilirating. It was amazing. I proved to myself that I'm a tough girl. That I am not a weakling. And I would do it all over again in a heartbeat...or until my sore muscles can recover. 4 Chichi, don't ever talk to strangers! You've heard the old ones say this line countless of times. It's practically ingrained in our childhood. I can't blame them, after all the world is just full of crazies. These days, not everyone can be trusted. 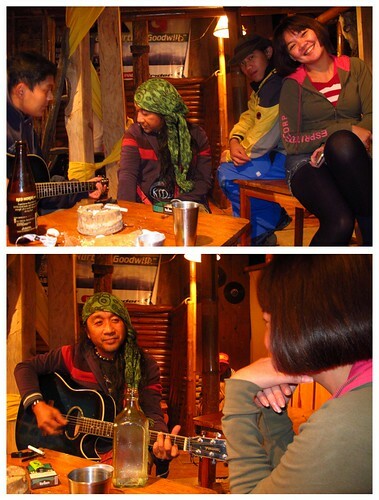 But if Zuring and I just kept to ourselves that night, we wouldn't have met and jammed with the locals of Sagada. We wouldn't have laughed with hilarious, fun and crazy Igorots whose love for Sagada shines even through the alcoholic haze. 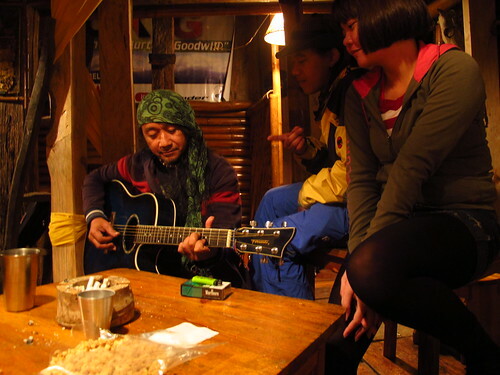 If we stayed home like good little girls, we wouldn't have met a Baguio celebrity whose songs about Sagada, the mountain province and Igorots are so beautiful it can make you weep. Jun Utleg is the Joey Ayala-Ka Freddie (Aguilar) of the Mountain Provinces. He is super famous in Northern Luzon. Ever since we arrived, we've been hearing his name said in half-whispers and in almost reverent tones. We found out why he's so popular when he, as luck would have it, stopped by Bamboo Grill and Bar, where we just happened to be chilling. Here's one of my favorite songs from Jun about the beautiful women of the Mountain Province, the Igorotas. Here's another favorite from Jun Utleg that shows absolute love for the place called Sagada. Yes, it probably would have been safer not to talk to strangers. But I gotta say, that would have been boring as hell, too. Nah, I'd rather have fun and interesting than safe and boring any day. 5 Don't you ever, ever scare me like that again! And the 5th thing that we did in Sagada that you should never tell my Daddy? Well...this is the one thing that I couldn't risk writing here for fear that somehow, in some way, my Papa Bear would find out. Scratch that, my Papa Bear is the least of my concerns when it comes to this little 'adventure'. To make sure that this blog will remain as the Sole SisterS (emphasis on the S) and not the Sole Wanderer, I'm not going to write about it. I'll leave it up to you to guess what that was. If you think you know what we did, ssssshhhh! Don't tell my Daddy! 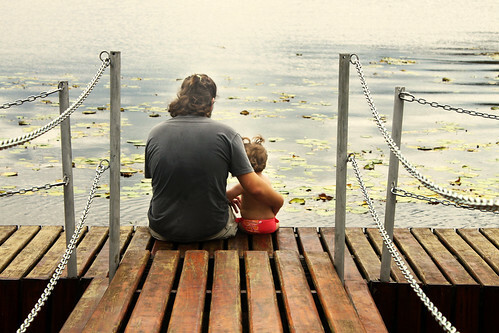 For most Dads, their daughters would always be little girls no matter how old they get. That's the reason why they're so over-protective. That's an overspill of their love for us. Make mo mistake, I will always be that little girl to my Papa Bear. Yet sometimes, like a little bird, I need to stretch my wings and see where the wind takes me. Sometimes, I need to stick my neck out and be brave enough to take on the world. 20 feet in the air! Splash. ﻿﻿﻿﻿ What was the most daring, crazy, out-of-this-world thing that you've done in your travels? Share it with us below. I promise not to tell your Daddy, if you promise not to tell mine. eeeee sumaging cave. i'd like to try that fun sometimes, and i'll try not to cling to the guide. hahaha. probably i'm gonna make a don't tell my mommy post. weh. What was the most daring, crazy, out-of-this-world thing that you've done in your travels? You go Chyng! Ikaw na ang may life insurance ;p Wala ako nyan eh! i'm a father to 2 little girls (2 years old and 6 months old). maybe i could relate to the words of your dad someday...hehehe. seriously, when they are old enough, i would love to take them with me in my out of town trips and adventures. intriga yung number 5 ah. hehe. yay to topload! we did that too when we were on our way to Mt. 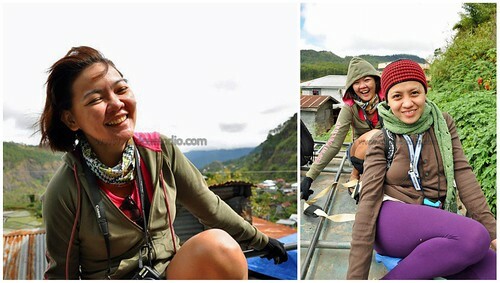 Pulag and we also did it when we were in Batanes :D we got sunburnt but it was worth it! :D way to go ms. figgy! My mouth's still zip with #5! I'm taking a bow for that dive - albeit it wasn't too graceful. That's why I was shrieking like a banshee, COLD! Will probably topload every chance I get from now on Figlet! Thorougly enjoyed it. wow!! ang kulit ng video!! I posted something like this sabay pala tayu ng post about parents woot!! ang saya! Wish to go to Sagada this summer! It was really fun Ada! 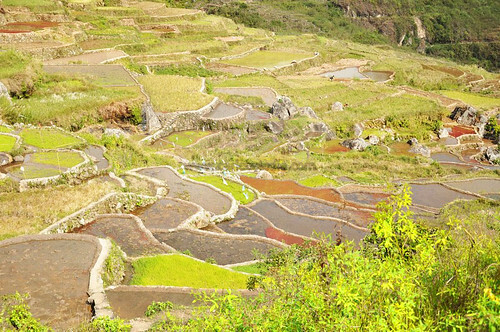 You shouldn't miss out on Sagada. And the Sumaging Cave connection, too! hey chichi! had they mentioned if it's also safe to dive head first?? I would like to try that, I'll be going to Sagada next week. I'm not sure if it's safe to do it head first. Its not really deep Akasha, I think it's better to err on the safe side ;) Enjoy that dive, for sure it will be exhilirating! Sorry akasha, your comment must have been in the spam folder :( Hope you didn't dive headfirst on that falls, that would have been risky! 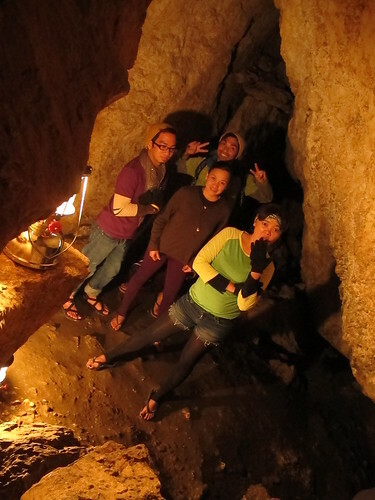 Care to share about your Sagada experience? Alam mo na yun Benj! Hey RC! 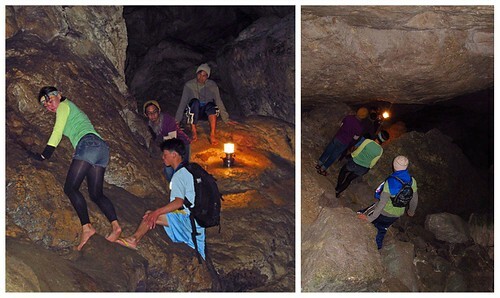 Sagada would have been perfect for Holy Week. Something that's out of the ordinary trip to the beaches of the Philippines. 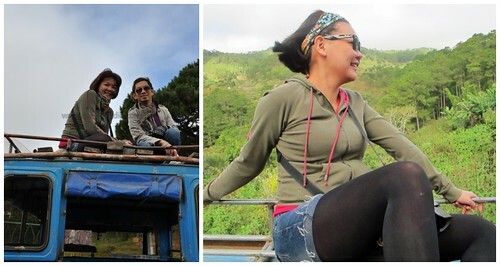 Did you end up going to Sagada? Thanks for following our journey Jan! ah. and the inspiration for ideas just keep pouring! i am so dying to make a cliff jump! Go for it Brenna! It's exhilirating, it makes your senses tingle. It makes you feel alive! i think number 5 was shrooms, or something of sorts.